After the introductions “Visualization techniques with plants” and “Biosensing for Human Computer Interaction” the next projects using some of the already mentioned techniques. However, this chapter focuses on various approaches of network and community designs. Previous Land Art initiatives and projects were always closely tied to social and cultural resonance. These efforts resulted in social activations of local communities and local conditions [KastnerWallis2010, pages 15-28]. Our exploration investigates the application of current technology and design tools in this field. We will start with community design approaches that do not need a physical presence of humans. Design approaches for location-based communities with a supportive use of digital communication technology will be described afterwards. Before the exploration starts, two terms have to be declared. The term network is used when two units (e.g. plant displays) interact with each other without any human interventions. Whereas we call a human to human, human to plant, or human to machine interaction a community activity. In this context every process that is directly related with humans is determined as a community driven approach. Both terms can exist within one project. The term network describes usually the technical implementation. The community design uses the network infrastructure and creates depending on it the social communication mechanism. 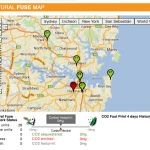 Natural Fuse creates a city-wide network of electronically-assisted plants that act both as energy providers and as circuit breakers. The mechanics of the network are based on an internet connected automated watering plant system and on three interaction modes (selfish, selfless, and off). The selfish user can absorb electricity beyond his neutral consumed CO2 footprint. The over consumed electricity of the selfish user is provided by the selfless users. 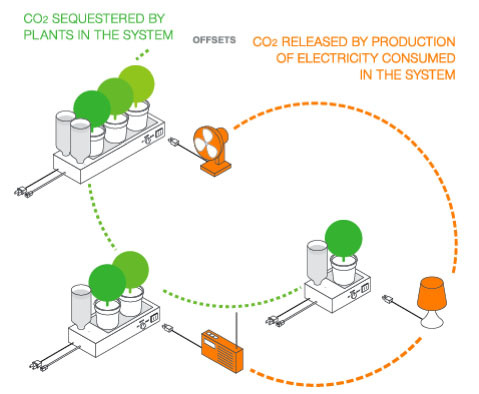 The selfless users increase the amount of available CO2 neutral electricity consumption within the “Natural Fuse” network. The interaction mode “off” disconnects the plant display from the network and acts as an autonomous “Natural Fuse” unit. The community design is enhanced by one additional emotional component. 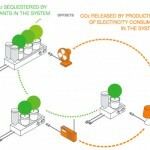 If the network provides too much available CO2 neutral electricity, some plants will be killed by the network system. The plants get killed because of excess capacity, and the assumption that they are not needed. If the opposite case occurs and the network capacity is completely exhausted, the connected electric devices on the “Natural Fuse” unit are switched off. The network activity is visualized as an online map with a representation of the “Natural Fuse” unit locations. 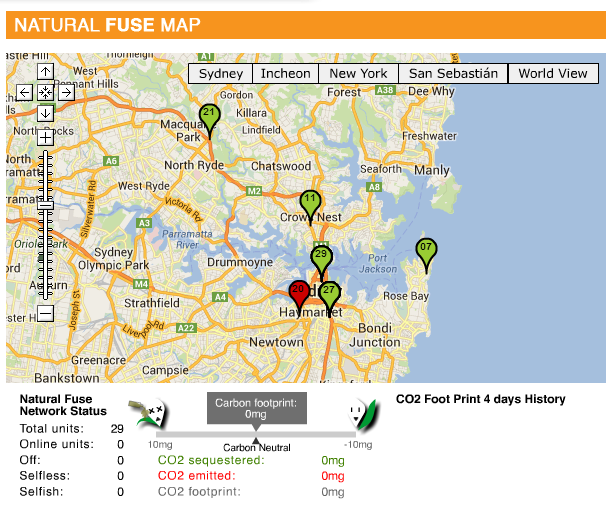 Furthermore, a graph below the map visualization informs the user about the current network’s CO2 footprint. During the operation of the network, a serious mathematic problem emerged. The ratio of consumed electricity and the plant’s power of neutralize this consumption is not balanced very well. For instance, a 50W light bulb needs approximately 360 plants to neutralize its electricity consumption. Despite of this unbalance, it has a proven educational impact on the users. The unbalance reveals the value of electricity. However, in the context of the community design it has a deadening impact. It is almost impossible for the network users to offset this unbalance. Unfortunately, the current state of the network confirms that the community was not able to solve that issue. The project "Telegarden" (1995-2004) can be described as a telerobotic community garden [GattiShapiro2010, pp. 75]. The internet users could control a remote robotic arm and perform the gardening tasks sowing and watering. The user interface for the remote control was accessible through a website. Two webcams monitored the garden development. One camera was placed directly above the robot arm and the other one was installed over the garden. With the help of a chat room, the “Telegarden” participants coordinate their activities with each other. Moreover, the chat room functioned as a virtual meeting point for the participants. The mechanics of the Telegarden’s Community Design were mostly based on garden activities. The plants encouraged the participants to visit the “Telegarden” website frequently. The communication between the users was forced on the limit of one robotic arm. The participants had to arrange themselves about the usage of this robotic arm. The chat protocol revealed that the Telegarden’s chat room was not only used to coordinate their gardening activities, but rather for conversations about general topics of life [KaFrAlFrCo2005]. One story was remarkable. A temporary handicapped user expressed his happiness that the “Telegarden” provided him. Although he was not able to work physically, the “Telegarden” project enabled him to perform an experienceable physical action through telerobotics. He got the feeling of being useful during his physical recovery. This case points out how a virtual community and telerobotics influence a physical environment. The project "Leaf++" [ISEA2011] has already been introduced in a previous chapter 3.1, where we investigated the visualization technique of this project. In the following paragraph we have a closer look at it in the context of community design. As mentioned before, the “Leaf++” software is able to attach digital content to a physical leaf. The generated leaf marker ID works very similar to a QR-Code. The digital content is stored on their content management system, and the physical leaf (marker) takes over the function of a link between this physical piece and its digital subject in the database. The most important mechanic of Leaf++’s community design is the exchange of digital content between humans. The digital unit can be consumed by any other “Leaf++” user. A mobile application enables the users to explore and attach content to an environment. For this reason, the “Leaf++” project encourages people to explore their natural and urban landscape. Exploring local environments is as much important for the “Fahrende Gärten” (2012) concept as for the “Leaf++” project. Instead of linking data directly to a plant, Theresa Weinelt created a Facebook Group that informs the habitants of Kiel about her project “Fahrende Gärten”. As mentioned before, she enhanced the concept of a community garden with mobility. Plants are placed into shopping carts that can be relocated somewhere in Kiel. Updates and activities related to the mobile gardens are communicated within the Facebook Group. Her approach of community design is strongly connected with social mechanisms of community gardens. The mobility makes her community gardens more accessible to a broader audience in Kiel. The habitants can push the shopping carts to every arbitrary place. The new location is posted voluntary to the Facebook group. The community design concept even involves people that only inform the group about the current location and condition of the mobile gardens. Of course, the people discuss other topics in the Facebook group, as well. In this relation, the “Fahrende Gärten” project provides a flexible level of communication and participation. This flexible level of participation even motivated some people, who are not into gardening at all, to leave a message (see example). The freedom of the project revealed also some disappointing results. For instance, the condition of one garden became very bad (see example). On the other hand other habitants cleared the mobile garden and plant new flowers in it. The project provides an insight how social media and mobile community gardens are used to encourage communication between habitants of a neighbourhood. The project "Botanicalls" (2006-2011) involves social media as a communication channel between plants and humans. In comparison to the other introduced projects, “Botanicalls” uses the approach of monitoring for providing the plant with a voice. The plant’s moisture level of soil is analysed by a microcontroller. If the soil is too dry, the plant can express its need of water on Twitter. The intention of this project is a better connection between humans and plants. 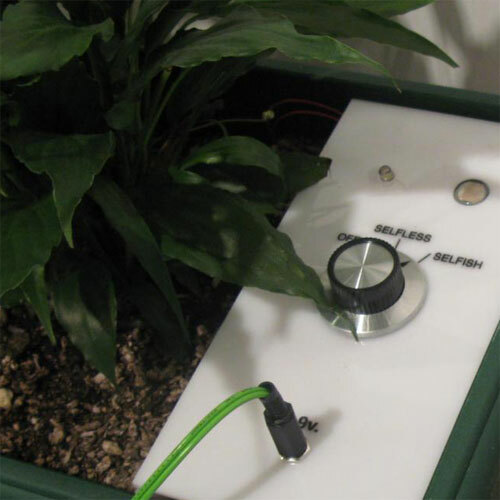 The “Botanicall” device can be applied to every plant or garden. The community design is mainly based on the mechanics of the Twitter service. When the plants need water, it sends a tweet. This tweet is not particularly directed to a certain person. Furthermore, it is accessible for all Internet users. Except the registered group members (Followers) receive direct notifications of the plant needs. The watering of the plant has still to be done by a physical present person. For this reason, the project “Botanicall” connects a physical location with current social media technology. The connection between a physical object and digital communication is very similar to the “Telegarden” project. Instead of a remote robotic arm the Botanicalls participants have to perform the garden activity by themselves. The approach of providing plants a communication channel is also very present in the context of urban gardening. The environmental conditions sun, wind, and temperature vary a lot in an environment. The London based “Platform Project” (1983) is a mixture of an art, activism and education initiative, which informs local communities about an ecological sustainable life style. Gardening and the distribution of horticultural knowledge is one of their objectives for enhancing life and social qualities [KastnerWallis2010, page 39]. Current communication technology, especially with the support of the internet, enables an easier documentation and distribution opportunities for these initiatives. The next introduced projects present examples in this context. Many cityscapes make it impossible to figure out the locations of urban gardens. For this reason, the urban gardening network “Garden Registry” (since 2008) created a social media platform for gardeners in San Francisco. One of their goals is to connect gardeners, although their other motivation is to establish an impression how immense the food production potential in San Francisco can be. The website users register their gardens to a database and inform the other users about the infrastructure of their garden. The gardens are visualized by an online interactive map and gallery application. The interdisciplinary collective OKNO established an open database for community gardens across Europe. Their platform “Connected OpenGreens” offers urban gardeners a comprehensive set of information. They provide a knowledge base about plants, bees, animals, and electronics. A registry of projects, peoples and gardens enables interaction between the urban garden communities. Especially, their garden registry contains a big amount of information. Almost every garden holds a description about its infrastructure (location, size, etc. ), the ecological environment, and the social environment. The ecological environment informs about the interactions between the garden and its surrounding. For instance, which animals (insects, bees, etc.) live in the garden. The sociological description offers an introduction about the community itself. For example, which kinds of visitors, who are the garden founders, and so on. Furthermore, it will be documented if the garden uses electronic garden monitoring. The electronic garden monitoring is a central topic in OKNO’s new initiative “ALOTOF” (A Laboratory On The Open Fields). They research how garden monitoring can be utilized for sonification and visualization. Furthermore, their research includes the topics biosensing, environmental monitoring and social interactions. They investigate how these three disciplines can be combined, what artists can develop with this generated biosensing data and in which scope the garden communities might benefit and improve their garden activities through this ambient technology. A proposal, how this monitoring can be technical implemented, is indicated by Ioannis Calemis, Christos Goumopoulos, and Achilles Kameas. 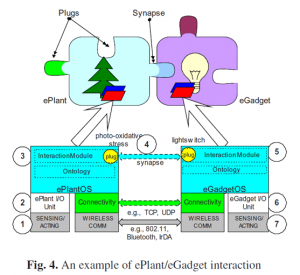 In their paper “Talking plant: Integrating plants behavior with ambient intelligence” [CaGoKa2006] they describe a tooling system for a better understanding of plant needs. Their system “bioGadgetWorld” (2004-2006) is driven by a composite infrastructure design [GoChriDrKa2004]. The composite approach enables broad ranges of devices and device combinations. For instance, the device “ePlant” can be endued with a “eGadget”. The “eGadget” can be a light source, water pump or a mobile. A predefined rule system (the Plant Ontology) determines the executed actions (see figure 66 on page 95). The “eGadget Mobile” sends notifications about the plant conditions. These approaches enhance the communication between plants and humans. Especially, non-experience gardeners get a better insight into plant needs. This improved communication will result in a better plant growth and health, which is again connected to successful gardening. Enjoying garden activities has a definitively positive impact on the connection between nature and humans [Shoemaker2002]. Furthermore, gardening still holds the ability of local identification [SchwFl1994]. The introduced projects reveal a broad range of approaches. The complexity of technological implementations ranges from high (e.g. “Telegarden”) to low (e.g. “Fahrende Gärten”). The presented interactions between humans are mostly centred on a plant or a garden. The plant or the garden takes mostly over the role as a connector. Obviously, it does not provide a communication technology, although it provides a common conversation topic between the people. It seems that this is already enough to bring people together and encourage communication between them. Furthermore, all project intentions target an educational mission. People should get a more conscious awareness of their (local) natural environment [Flagler1994, Shoemaker2002]. The concepts related to gardening try to improve the experience of community gardens. Their digital communication solutions enable stronger interactions within the community and partially a more efficient gardening. The social impact of this technologies and design approaches need further social research methods, which is beyond our possibilities in this thesis. [Flagler1994] Flagler, J. & Poincelot, R., (1994). People-plant relationships: setting research priorities. Food Products Press, 1994. [Shoemaker2002] Shoemaker, C. A. (2002). Interaction by Design: Bringing People and Plants Together for Health and Well Being. John Wiley & Sons, 2002. [GoChriDrKa2004] Goumopoulos, C.; Christopoulou, E.; Drossos, N. & Kameas, A. Markopoulos, P. (2004). The PLANTS System: Enabling Mixed Societies of Communicating Plants and Artefacts Ambient Intelligence. Eggen, B.; Aarts, E. & Crowley, J. (Eds.). Springer Berlin Heidelberg, 2004, 3295, 184-195. [KaFrAlFrCo2005] Kahn, P.H. ; Friedman, B.; Alexander, I.S. ; Freier, N.G. ; Collett, S.L. (2005). “The distant gardener: what conversations in the Telegarden reveal about human-telerobotic interaction,” Robot and Human Interactive Communication, 2005. ROMAN 2005. IEEE International Workshop on , vol., no., pp.13,18, 13-15 Aug. 2005. [CaGoKa2006] Calemis, I.; Goumopoulos, C.; Kameas, A. (2006). 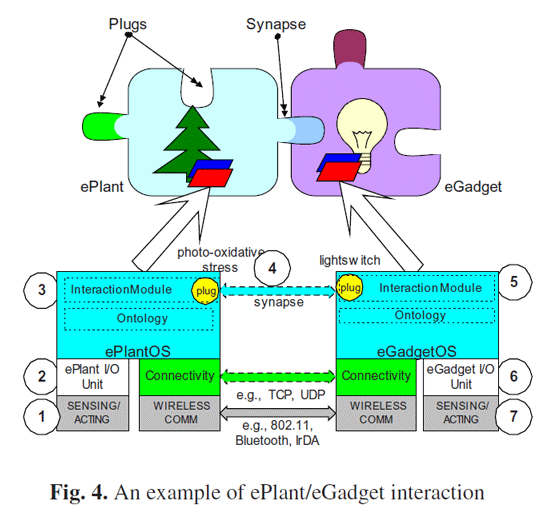 “Talking plant: Integrating plants behavior with ambient intelligence,” Intelligent Environments, 2006. IE 06. 2nd IET International Conference on vol.1, no., pp.335,343, 5-6 July 2006. [KastnerWallis2010] Kastner, Jeffrey; Wallis, Brian (2010). Land and Environmental Art. Phaidon Press, 2010. [GattiShapiro2010] Gatti, Gianna Maria; Shapiro, Alan (2010). Das technologische Herbarium. Avinus-Verlag, 2011. [ISEA2011] Aceti ,Dr. Lanfranco (2012). ISEA2011 Istanbul Uncontainable. In the 17th International Symposium on Electronic Art, LEA 18(5). The publication by Wolfgang Maass and Shahd Zahran Happy Plant: Self Controlled Production: Forecasting with Smart Sensor Technologies describes a Smart Sensor Architecture System. Their automated plant care system uses semantic web technology (RDF, OWL etc.) for interpreting the sensor data in a semantical context and furthermore describing a rule system for an appropriate plant treatment. This kind of research is very similiar to the above mentioned project “bioGagdetWorld”. Maass, W. & Zahran, S.. Self-Controlled Production: Forecasting with Smart Sensor Technologies, 23rd Workshop on Information Technology and Systems (WITS), Milan, Italy, 2013. From a Community Design perspective, the initiative FallingFruit.org (2013-201x) (facebook | video) and the German project mundraub.org (2010-201x (map) provide great online information about free food in (urbarn) environments. Both projects even follow the Open Data spirit, which enables software developers and interaction designers to experiment with their data. New location-based apps as well as information visualization can increase more awareness of nature and and food of a local environment. Another community project started 2012 and is called Food is Free Project (2012-201x). On their website foodisfreeproject.org, they explain how to use social media mechanics, like Facebook Groups and the #foodisfree Hashtag, for building up a community. This projects has the idealistic intentions like “FallingFruites” and “mundraub“, and applies social media tools like the above mentioned project “Fahrende Gärten“. Beyond food production, there exist some other motivations for plant-based online communities. The advantages and the love for trees in urban landscape is one of those. The article “Introducing ‘treeconomics’: how street trees can save our cities” (2015) by Patrick Barkham describes them very well. Software Tools for community and urbans forests, like i-Tree (2006-201x) and OpenTreeMap (2014-201x), encourage citizens, urban planners and other people to work togehter on a better urban lifestyle. These activities are very close to the intentions of current hot-topics Citizen Science, Big Data Analytics, and Smart City. The Dutch media artist Sander Veenhof translates attention from social media plattform into the grow process of a plant. His plant display Publicity Plant (2009) analyzes the feedback from online social media plattforms gives feedback of the monitored data (plant health data, soil moisture and light supply). In this context it holds strong connections to the above mentioned project Botanicalls. A little bit related to Botanicalls, Mate Marschalko developed a plant well-being sensor with an auditive and visual feedback system. Trees in a forest are kinda connected through a Mycorrhizal network. This network supplies additional nutrient storage and supply. Unfortunately nowadays we are not able to use that biologic network to detect dangerous circumstances of a forest and protect it. Therefore some activists created an additional network with old mobile phones. Each tree is connected with a mobile phone, which can call for help if the tree is damaged for example by illegal tree felling. This IoT network based on electronic waste is called Rainforest Connection (2015). Helene Steiner developed a new open-source hardware and software platform, called DECOD (2015), which encourage citizen scientist to re-connect and re-experience our natural environment. Her DECOD sensor device measures plant signals and sent it a browser based map application (geocoding), where it reveals all plant signals from it near neighbour plants. Identifying plants was and still is a base skill of each botanic interested person. Unfortunately, beginners in that discipline are very often overwhelmed by the amount of data. Thanks to the little computer in our pockets (smarthphones), computer scientists develop some nice mobile apps for us to identify plants easier. Especially, the project Pl@ntNet (2014-2016) by French coders provides us access to botanic community. If the user of the mobile app does not know the plant, s/he can can open help request. The other memebers of the community can then identify the plant. In contrast to the community approach Anne Lang, a Product Designer from Germany, has developed the webapp floradex (2015) for simplifying the identification of plants. The user can assign some certain structure of the plant’s body. Then the user can chose between those predefined specifications of blossoms, stems/trunks, and various leaf types. The search result is then a collection of possible plants. The data comes from a database provided by the Berlin Botanischer Garten. The Green Thumb initiative is the biggest Community Garden network of the US. The website is a great example how local garden communities connect to and support each other. SmartOysters (2017) is a Software as a Service (SaaS) collaborative farming platform for the oyster and related aquaculture industries. SmartOysters is a collaborative farming platform connecting farmers with each other, and directly to wholesalers, restaurants and consumers for a complete tide to table experience. The mobile app iNaturalist is a mobile app for Android and iOS, which encourage people to explore nature and plants. The user can upload plant picture and discuss the kind of plant kingdom with other users. Knowledge Exchange of plants is one critical community design of this platform.